Bindu Mukherjee is the chief Image Consultant and Director of Bindu Mukherjee Image Consultancy. She is a certified Image Consultant from the Image Consulting Business Institute. The program is structured by Judith Rasband, the first Certified Image Master in the world. After graduating from the Institute of Hotel Management Catering Technology & Applied Nutrition, she was placed from campus into the Welcomgroup Management Training program affiliated to I.H.A France. On successful completion Bindu was placed as Deputy House Keeper at WG Chola Sheraton, Chennai. In 1992, Bindu was part of the first batch of International Cabin crew based out of Chennai for British Airways Plc. and has received formal training from them in London, U.K. Bindu is a recipient of the Cabin Crew award for her outstanding customer in-flight services. She worked with them for over 14 years and her job has taken her to different continents and provided her with a perspective into Global culture and fashion sensibilities. Image Consulting has been a natural progression for her from her previous roles in the Hospitality and Aviation industry. 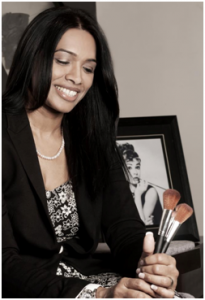 Bindu helps Corporates and Individuals on managing their Image to create a powerful first impression by combining her experience and expertise of Image Management, Cosmetology, Wellness and her work experience from the past. Bindu possesses excellent interpersonal and communication skill and loves to meet people and work with them. She is happy to be in a career which is her passion and Bindu looks forward to continue to make a difference to her clients and herself. I want to become a trained image consultant, so that I would be able to own your franchise either at Mumbai or Bangalore. Please guide me with all the details.I am available for contact at Vasi, Navi Mumbai.I am a graduate in Hotel Management from Pune University and just completed M.B.A.(Human Resources) from I.T.M.,Kharghar. .You cleared my concepts on dressing as I had it all wrong.I am happy to have discovered you and thanks once again for your support. Thank you Purnima and all the best. This service is available in Hyderabad as well. For more details, kindly contact on 0226430438/9. Thanks a ton Bindu, I owe you a treat…followed your professional advice to the “T” and guess all added up to the success. Absolutely. We have centres all over India. Please get in touch with our ICBI office at Hyderabad. All the very best. Congratulations and you are most welcome. All the best. I wish to have a image consultation, can u tell me if there are any services in chennai? Image Management services are available in Chennai..Kindly send your contact details or you can call on 022 26430438/9.. Image management services are available in Chennai too. For more details, kindly call on 022 26430438 / 9. Thank you for your very professional and personalized services.You have given me lots of helpful and useful knowledge which I can also use in the future. Thanks again and keep in touch. Thank you Gargi,you are most welcome.Good luck to you. I am Parinda Purohit, a jewelry professional from Mumbai. I would like to get image consulting done for myself. I would like to get more information regarding the course details, charges and duration. Looking forward to receiving a response at your earliest. Congratulations for choosing to make a difference in your life. I have now moved base to Gurgaon, Haryana. However there are competent Image Consultants in Mumbai,who can help you. For all details and information please contact our Mumbai office 26430438/39. All the best . Please leave your coordinates and I will contact you. i m looking for image consulting for myself … may i know what are charges ? Dear Hansdeep. Please leave your co-ordinates and I shall get in touch with you. i want to avail ur services.kindly give me more details abt courses and cost of these courses. I am looking for Image consulting services. Please let me know the details of the services and the charges?